This episode of If You Love This Planet features a lecture host Dr. Helen Caldicott delivered October 16, 2011 at the International Integrative Medical Conference in Sydney, Australia. Dr. Caldicott explains the medical dangers of the nuclear fuel cycle, including uranium mining, and talks about the current situation at the devastated Fukushima nuclear power plant in Japan, as well as the poliltical situation in the U.S., the threat of nuclear war and global warming. As background, read Dr. Caldicott’s books Nuclear Power is Not the Answer and If You Love This Planet. 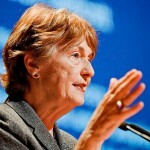 Visit the website of the Helen Caldicott Foundation/ Nuclear-Free Planet for nuclear-related news articles and resources. Watch Dr. Caldicott’s October 2 interview with writer Heidi Hutner. This entry was posted on Friday, October 28th, 2011 at 12:00 am	and is filed under Uncategorized. You can follow any responses to this entry through the RSS 2.0 feed. Both comments and pings are currently closed. Much more intellectual honesty, moral courage and humanistic action is needed. We are about to become a species of 7 billion overconsumers, overproducers and overpopulaters on a finite and frangible planet where resources are dissipating and environs degrading rapidly. As we observe absolute global human population numbers continue to soar exponentially, despite reduced fertiliy rates in many places, we also recognize that never in the course of human events have so few taken so much from so many and determined to leave so little for others. During my lifetime, when human numbers explode from less than 2.3+ bn to 7+ bn worldwide, many experts may not have known enough about what they were talking about when they spoke of human population dynamics and all causes of the human overpopulation of Earth. Their research appears not to be scientific, but rather issues from ideological or totalitarian thinking, or from a specious group-think consensus. Their all-too-attractive thinking, as viewed by greedmongers, is willfully derived from what is politically convenient, economically expedient, socially agreeable, religiously tolerable and culturally prescribed. Widely broadcast and long-accepted thinking from an astonishingly large number of so-called experts in the field of population dynamics appears to have an unscientific foundation, and is likely wrong. Their preternatural theorizing about the population dynamics of the human species appears to be both incomplete and misleading. Most disturbing of all, a widely shared and consensually validated theory about a benign “demographic transition” leading to automatic population stabilization a mere four decades from now is directly contradicted by unchallenged scientific research. As a consequence, and it is a pernicious consequence, a woefully inadequate and fundamentally flawed theory has been broadcast during my lifetime and continues to be broadcast everywhere by the mainstream media as if it is not only science but the best available scientific evidence. The implications of this unfortunately dishonest behavior, inasmuch as it appears to be based upon contrived, ideologically-induced logic as well as an undeniable misperception of what could somehow be real regarding the human population, appear profound. This failure of nerve by ‘the brightest and the best’ has slowed the momentum needed to confront a formidable, human-forced global predicament, one that looms ominously before the human family in our time. In their elective mutism regarding an incredible error of thought and perception during my life cycle, are first class professional researchers with expertise in population dynamics behaving badly by allowing the “ninety-nine percenters” to be misguided and led down a primrose path by the “one percenters”? The power of silence on the part of knowledgeable human beings with feet of clay is dangerous because research is being denied that appears to shed light upon a dark, non-recursive biological problem, the understanding of which appears vital to future human well being and environmental health. Too many experts appear to be ignoring science regarding the human population. By way of their willful mutism they effectively consent to the leviathan scale and unbridled expansion of global overproduction, overconsumption and overpopulation activities that are being actively pursued as well as silently condoned by greedmongering masters of the universe, the tiny minority among us who are primarily responsible for ravaging the Earth, ruining its environs and reducing its fitness for habitation by the children. If this assessment of human behavior is indeed a fair representation of what is happening on our watch, then the desire to preserve the status quo, mainly the selfish interests of ‘the powers that be’, could be at least one basis for so much intellectually dishonest and morally bereft behavior. Could it be that the outrageous per capita overconsumption, large-scale corporate overproduction and unrestricted overpopulation activities of the human species worldwide cannot continue much longer on a planet with the size, composition and ecology of a finite and frangible planet like Earth? For human beings to count human population numbers is simple, really simple. The population dynamics of human beings with feet of clay are obvious and fully comprehensible. We have allowed ourselves to be dazzled by the BS of too many demographers just the way human beings have been deceived and victimized by a multitude of economists on Wall Street. Demographers and economists are not scientists. The brightest and the best have sold their souls to greedmongers, duped the rest of us, made it difficult to see what is real, proclaimed what is knowable as unknowable, and deceitfully engaged in the their own brands of alchemy. In their duplicitous efforts to please self-proclaimed masters of the universe, also known as the keepers of the ‘golden calf’ (a symbol easily visible now as the “raging bull” on Wall Street), they perpetrate frauds at everyone elses expense, threaten the childrens future, put life as we know it at risk, and are deliberately precipitating the destruction of Earth as a fit place for human habitation. There are many too many overly educated “wise guys” among us who see the blessed world we inhabit through the lens of their own hubris and selfishness, and see themselves somehow as Homo sapiens sapiens and masters of the universe, as corporate kings and emperors with clothes. They supposedly are ”the smartest guys in the room”, like the guy who used to run the global political economy without recognizing that there was an “ideological flaw” in his economic theories and models, the same guy who reported he could not name 5 guys smarter than himself. These are guys who have denied science, abjectly failed humanity, forsaken life as we know it, the Earth and God. These ideologues rule the world now and can best be characterized by their malignant narcissism, pathological arrogance, extreme foolishness, addiction to risk-taking and wanton greed. The idea that our descendants would make the same colossal mistakes we are making now, because knowledgeable people in our time chose to remain hysterically blind, deaf and electively mute rather than acknowledge science, is absolutely unacceptable. If such an impossible thing was to occur, would a conscious determination not to fulfill both a responsibility to science and a duty to warn humanity be tantamount to the greatest failure of nerve by the brightest and best in human history? If aware and responsible human beings were to be granted the opportunity “to will one thing“, let it be that we share widely an adequate enough understanding of all extant science which discloses the population dynamics of the human species to the family of humanity, so those who come after us do not take the “primrose path” we are trodding now, a path that has been adamantly advocated and relentlessly pursued at the behest of the most arrogant, avaricious, foolhardy, wealthy and powerful movers and shakers on our watch, a path to confront some unimaginable, human-driven sort of colossal global ecological wreckage. It’s no good excluding Tony Abbott from your criticisms. His scientific illiteracy is something he should be ashamed of. For instance, he believes carbon dioxide is weightless. He hasn’t heard of the term “peak oil”. He thinks climate change is absolute crap. He is mired in religious mumbo jumbo. Where does he stand on the export of uranium? Nuclear power in Australia? Australia being used as a nuclear dumping ground? I suspect his position should be of great concern, and he certainly should not be let off the hook.